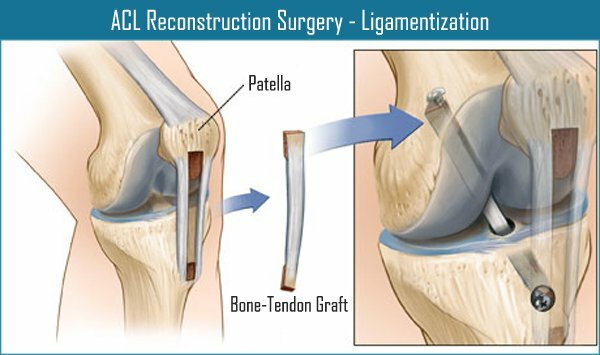 As discussed in our recent article, anterior cruciate ligament (ACL) reconstruction surgeries employ tendon grafts, such as the patellar tendon or hamstrings tendon, following which a new ligament grows on the tissue graft. The phenomenon of remodeling (or differentiation) of a tendon into a ligament is termed as “ligamentization”. Here, a question arises as to how a tendon graft grows into an anterior cruciate ligament? Before elaborating on the above question, let’s have a look at the differences between a tendon and a ligament. Tendon is tough and inelastic in nature. A ligament is strong and elastic. In terms of structural properties, a tendon is modified white fibrous tissue. Ligaments are modified yellow elastic tissue and comprise of a few collagen fibers. Fibers are arranged in parallel bundles in tendons. In ligaments, fibers are densely placed but are not arranged in parallel bundles. With respect to function, tendons are tissues that connect muscles to bones. Ligaments are tissues that connect bones and helps in holding them at their anatomical positions. The ACL reconstruction procedure was implemented on the basis of numerous animal studies which showed that the implanted tendons differentiated into ligaments, over time. However, biological changes and phases of ligamentization in humans have not been understood clearly. In 2011, The American Journal of Sports Medicine published a literature review on “ligamentization” in human anterior cruciate ligament reconstruction surgeries. It was found that a tendon graft undergoes a series of biological changes (collectively known as ligamentization), in the intra-articular (within the joint space) environment. Although ultrastructural variations were evident, histological similarities were found between mature tendon grafts and human anterior cruciate ligaments. However, the time taken by tendon grafts to remodel into mature ligaments could not be ascertained. Additionally, the histological changes that occur in other autografts used in ACL reconstruction surgeries were not proven to be similar. When compared to animal grafts, human tendon grafts was shown to take longer to remodel into mature ACL ligaments. Besides, animal grafts showed an early phase of necrosis, whereas significant signs of necrosis were not found in human grafts. Hence, it was concluded that the outcomes of animal ACL reconstruction grafts were not the same as those of humans. It was proposed that the ligamentization process of an ACL reconstruction graft in a human knee needed further study. A clear knowledge of the phases of ligamentization would be helpful in determining the methods and duration of post-surgical rehabilitation and recommended time span after which a patient could resume their normal activities. ACL Surgery, ACL Tear ACL, ACL injury, ACL reconstruction surgery, ACL surgery, ACL tear, anterior cruciate ligament, Double-bundle ACL Surgery, ligamentization, Single-bundle ACL Surgery. permalink.